And finally, our response to the owners with a link to photos that seem to be at odds with the tanker’s captain. I’m sure we’ve gone on about the psycho tanker incident enough now but I thought it was intersting enough to complete the story that started back in July. Thank you for your reply to our email. I cannot begin to express my thanks for your answer as I did not expect an answer from Eitzen Chemical. Thank you very much for expending the time to look into this incident. My apologies for the delay in replying, since arriving back in Seattle we have hauled the boat for much needed maintenance and have been busy with re-establishing a shore-side life. 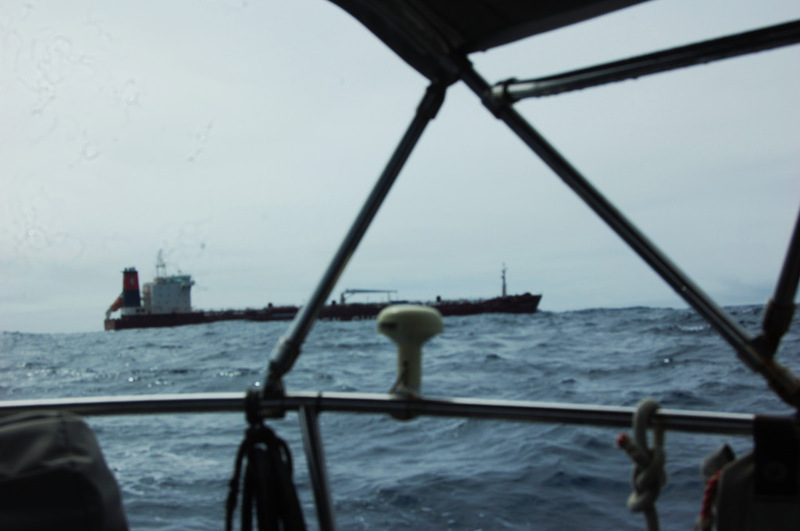 I have already sent you a copy of our report to the US Coast Guard in Hawaii, I would like to also direct your attention to a series of photos we took during the incident as the tanker passed by. The photos are at http://www.svyohelah.com/piwigo/index.php?/category/122 the dates are off 1 day due to the server location on the other side of the international dateline from the boat’s location. I would like to volunteer a few comments regarding these photos and associated discrepancies in the report you were provided from the ship. 1. Weather – In all photos the wind is clearly behind SV Yohelah, we are sailing with a south westerly wind off our port stern quarter on a heading of 82 degrees True at 5 knots. Contrary to the assertion from Siteam Leader, the seas are obviously not “moderate becoming rough”. Wind was less than 11-14 knots, sea state was pretty flat with long period swell even for our small boat. NOAA Sea State Analysis for this date clearly show us between high pressure systems with no increasing winds or sea state. 2. Sea state – With wind from behind us as shown in the photos, we were not rolling in the waves, certainly not “rolling and pitching in the moderate sea waves”. The very small waves. 3. Course changes – Since the wind is from the southwest and we are heading east, Siteam Leader is heading just west of north. This seems to contradict their assertion they only changed course 10 degrees. Especially when you compare Photo 1 with Photo 5 in which they turn more than 90 degrees as they passed us the first time. 4. Distance – These photos show less than 1/4 miles separation between the two vessels. Certainly a bit closer than the 1.5-2.0 nautical miles (nm) claimed by Siteam Leader. 5. Yohelah’s size – At a range of .22 nm, it is unfathomable that Siteam Leader would describe us as a 55 meter sailboat. Our 13 meter sailboat usually doesn’t appear 4 times larger. 6. Derelict – This is the first time our sailboat has been described as a derelict. The Osaka Tannowa Yacht Club website contains many photos of our boat before we left Japan, they are at http://www.tannowa-yc.jp/NOCTILUCA/yohelah/yohelah.htm – also our website has many pictures of our boat. Our last survey listed our condition as ‘Bristol’. Please feel free to come to your own conclusion about the boat condition. These pictures clearly contradict enough of the report you received from your ship operators to establish the complete fiction represented. I only hope the ships logs do not contain this erroneous information since ship’s logs are generally required to be accurate from a legal viewpoint. My original hope was for the Captain of Siteam Leader to at least have to answer questions from someone in an official capacity; perhaps the experience would change his behavior in regard to recreational vessels. I believe that goal may have been accomplished and we can hope there will be no recurrence of this sort of incident with this Captain. I will provide copies of our emails to the US Coast Guard for inclusion in their investigation and also include this in the blog on our website. Thanks again for taking this seriously enough to look into the incident; while I do not believe you were supplied with accurate information I appreciate your efforts.